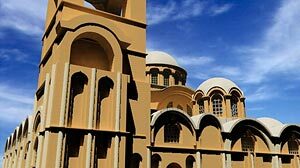 According to the fourteenth-century historian Nicephoros Gregoras, the first church on the site (a basilica) was presumably built in the sixth century by a certain Theodore, relative of empress Theodora. The only trace from this phase of building is a wall arcade at the eastern end of the church. No reconstruction is possible. The crown of the south arch of the sixth-century wall arcade collapsed and was rebuilt. Two tomb chambers underneath the naos seem to belong to this phase. The church is rebuilt (after collapse during an earthquake?) under the Sebastokrator Isaak Komnenos. While using some of the walls of the earlier church, the eastern apse was completely rebuilt, the four column support removed and the dome enlarged over a wider naos. Massive masonry piers were added in the corners of the naos during this period. The church probably featured a narthex topped by twin domes. A chapel (of uncertain shape) existed on the south side of the church. Metochites utilized the supports and eastern apse of the previous church, but rebuilt the Pastophoria (rooms on either side of the apse). He added new rooms on essentially all sides of the church: two narthices, a parekklesion (or funerary church) on the south that communicates with both the inner and outer narthices and a two-storied north compartment that is said to have functioned as a library. The interior decoration of the church is entirely the result of Theodore Metochites's patronage. 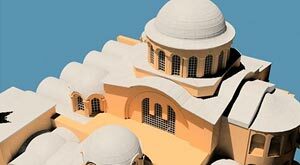 This segment of the "Restoring Byzantium" Web site draws on Macromedia Flash and Apple QuickTime technologies. Download the latest versions of these plug-in for optimal viewing. 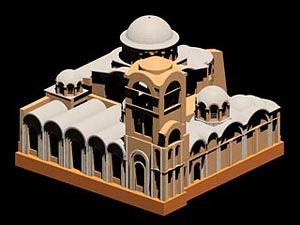 Turkey, Istanbul (Constantinople), Kariye Camii, Model.